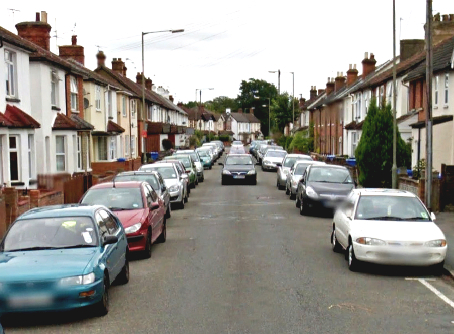 NEARLY every household in a Maybury road has signed a petition in protest against their street being used as a rat run. Arnold Road has suffered excessive traffic pollution for many years and, despite an expensive bypass built to divert traffic from Sheerwater’s Albert Drive, it is still being used as a thoroughfare. The headline of a £5.5 million project, the Sheerwater ‘Link Road’ connects Monument Road and Albert Drive, and was designed to negate the use of local narrow streets. It opened back in November 2013. Now, in a street with just 85 houses, 78 Arnold Road residents have backed Labour-led calls for intervention, and on Wednesday they showed their solidarity with a demonstration outside the Civic Offices in the town centre. The protest kicked off at 5.30pm, just prior to a Surrey County Council Local Committee for Woking meeting. Councillor Tahir Aziz, who scooped a Maybury & Sheerwater seat in this year’s election shake-up, presented the case and called for a Prohibition of Traffic Order on grounds of pollution, noise and congestion. He said a sign reading ‘Prohibition of motor vehicles except for access’ should be displayed at the junction with Albert Drive. Cllr Aziz said: “The council need to get their act together. It is a massive waste of public money if the bypass is not used as intended to relieve both Eve and Arnold Roads from the polluted environment from which they have suffered for many years. “During our canvassing in early March the residents of Arnold Road raised several issues with us, with one of them being way ahead of the others. Almost every household objected strongly to the unwelcome through-traffic from Albert Drive with all the noise and pollution caused by it. Vice Chairman and Acting Secretary of Woking Labour Party, Liz Evans, says the plight of residents cannot go on. “Health hazards from exhaust fumes in congested urban roads have been exposed by a current Sunday Times investigation,” she explained. “The right to breathe clean air is now upheld in EU law. The UK is lagging well behind this directive and must now present plans to meet it by the end of 2015 or will have to pay hefty fines.